After having a 3 day weekend last week, I think every Monday should be part of the weekend. I know Thanksgiving is coming up and I very ready for a long weekend. It still seems so far away, even though it is right around the corner. Last year we got a "grown-up" tree for our family room. What a difference it made! Friday night we put up the tree and decorated it while enjoying a little pink champagne. It's one of our traditions. We always enjoy a little champagne while putting up Christmas decorations. Saturday was spent running errands, watching football and getting some chores done around the house. It's always a great weekend when the Badger's kick Nebraska's booty. Especially when you get to enjoy your Christmas tree while it is going on. Saturday night we relaxed with some adult beverages and enjoyed the tree. Sunday was quiet. We slept in, watched some football, I cleaned up my office to make room to start wrapping Christmas presents soon. All-in-all it was a lovely weekend. We still have more decorating to do. We put up a tree in our living room that we are going to save until Thanksgiving weekend and outdoor lights still need to go up at some point. I will do a closer look at our tree and decorations as December gets closer. As always, the weekend was too short! What did you do this weekend? Are you for or against pre-Thanksgiving Christmas decorations? Ooooo I'm jealous! I'm not sure when outside lights are going up! Probably the end of Thanksgiving weekend. Fingers crossed the cold weather we are having breaks before then! Thanks for stopping by! I JUST LOVE YOUR TREE! That's what I wish my tree looked like--but my husband won the Rock, Paper, Scissors when we first got married (I'm not kidding--that's how we settled that fight) and so we put boring white lights on our tree! 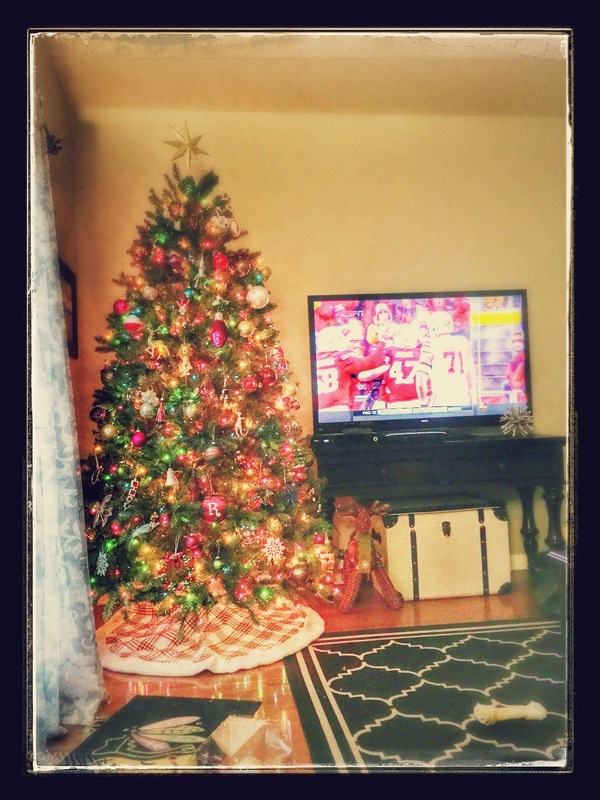 I have to tell you, though, that when I saw your picture in my bloglovin' feed this morning (yes, and I'm just now getting a chance to read your post) I decided I'm putting my tree up tomorrow. Because I freaking want to. haha! LOL Joey you are too funny. I am usually DAYS behind on my BlogLovin' feed! I'm so glad you like our tree! We do put up 2 trees, one in the living room that has white lights and this tree in the family room. The living room tree isn't up yet. I'm sorry you lost that one. Christmas trees should have colored lights! We settle things with Rock, Paper, Scissors too ;-) Can't wait to see your decorations! yay for bubbly and decorating. Sounds like a perfect night. I think bubbly and anything go quite well together, but particularly Christmas decorations. We had a blast! Thanks for stopping by!